In our previous blog post, we discussed how high blood pressure (or hypertension) can be impacted by lifestyle factors such as a high salt intake. 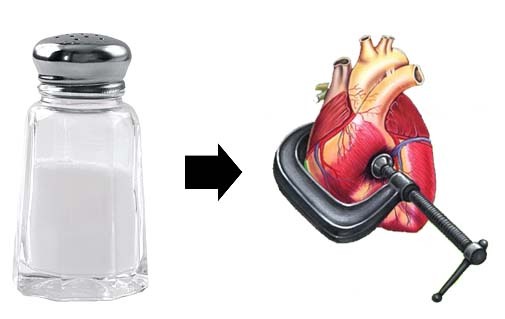 So how does salt increase blood pressure? When our salt (sodium chloride) intake levels are very high, the kidneys cannot keep up with the excretion and the salt ends up in our bloodstream. The body compensates by retaining more fluid to dilute the sodium levels, which increases blood volume. This then raises blood pressure as the heart has to work harder to pump the larger volume of blood around the body. Only about 25 per cent of our sodium intake comes from the salt shaker. The rest is hidden in processed foods that have salt added during manufacturing. One gram (1000 milligrams) of salt has 400 mg sodium. The National Health and Medical Research Council has set an ‘Adequate Intake’ of 460–920 mg of sodium (equivalent to 1.15–2.3 grams of salt) per day and a ‘Suggested Dietary Target’ of 1600 mg of sodium (about 4 grams of salt) for Australian adults. However, most Australians have a daily salt intake of about 10 grams. The recommended amount of sodium for people with hypertension is about 1500 mg a day. Salt is listed on nutrition panels as sodium. Foods with less than 120 mg per 100 grams are low in salt, while foods with more than 500 mg per 100 grams are high in salt. Luckily, the food industry has been involved in reformulating some products to reduce salt levels. For example, Vegemite has been reducing its salt content since 1974 and now has 13 per cent less salt than the original recipe. Eat more fresh food (plant or animal). Use herbs, olive oil or lemon juice to enhance flavours instead of adding salt. Compare food labels when shopping and look for foods labeled ‘no added salt’ or ‘salt reduced’. Buy reduced-salt bread and breakfast cereals. A slice of commercial brand bread can have up to 200 mg of sodium. Stay away from highly processed products such as instant noodles and pastas, canned soups and dehydrated soup mixes. Cut back on processed meats like salami, ham, corned beef, bacon, smoked meats/salmon, sausages and chicken loaf. Limit takeaway foods, especially pizza, burgers, pies and sausage rolls. When possible, choose low salt options such as a salad. Use fresh or frozen vegetables as canned vegetables have a higher salt content. Try and avoid frozen meals, canned meat/fish, potato chips, cheese, ready-made salad dressings, soy sauce, tomato sauce and mayonnaise as they are high in sodium.